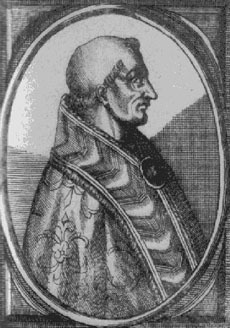 Celestine IV, born Godfrey Castiglione, Roman Catholic Pope in 1241, son of a sister of Pope Urban III. He was archpriest and chancellor at Milan. After Urban's death he entered the Cistercian monastery at Hautecombe in Savoy. In 1227 Pope Gregory IX created him cardinal priest of St. Mark's, and in 1233 made him cardinal bishop of Sabina. Elected to succeed Gregory on the 25th of October 1241, he died on the 10th of November, before consecration, and was buried in St. Peter's.